Learn to play the drums! Learn to play the drums with DISCOVER DRUMS. This tabletop drum set has great sounds you can play on the four drum pads. 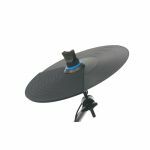 You get 26 different drum sets for all kinds of musical styles. You can rock out loud with DISCOVER DRUMS' speaker system or plug in your favorite headphones and practice quietly. Built-in learning features including a follow-the-lights exercise make it easy – even if you've never played before you'll be making beats in no time. DISCOVER DRUMS also has 49 patterns you can play along with for fun music making. Drumsticks come in the box, so you'll be ready to rock! Learn to play the drums with DISCOVER DRUMS. 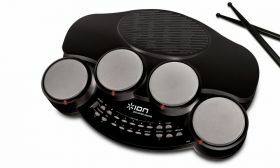 - Four drum pads with 26 different drum sets. - Play quietly with headphones or rock out with built-in speaker. - Fun to learn! Follow the lights to practice your rhythm and timing. - 49 patterns for playing along with music. - Drumsticks included so you’re ready to rock. 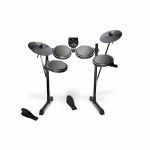 - DISCOVER DRUMS 2 tabletop drum set. 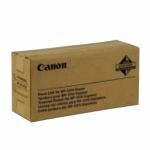 Requires on batteries (six C cells) or AC adapter, both sold separately.